Asus is known for its great desktop hardware and its lineup of laptops. The ROG series of gaming laptops are highly popular due to the fact that they provide insane specifications for a laptop catering to the gaming community. But gaming is not everyone’s go-to choice and most of the users will be wanting a laptop that is suited for casual and business use. Asus has got them covered too. 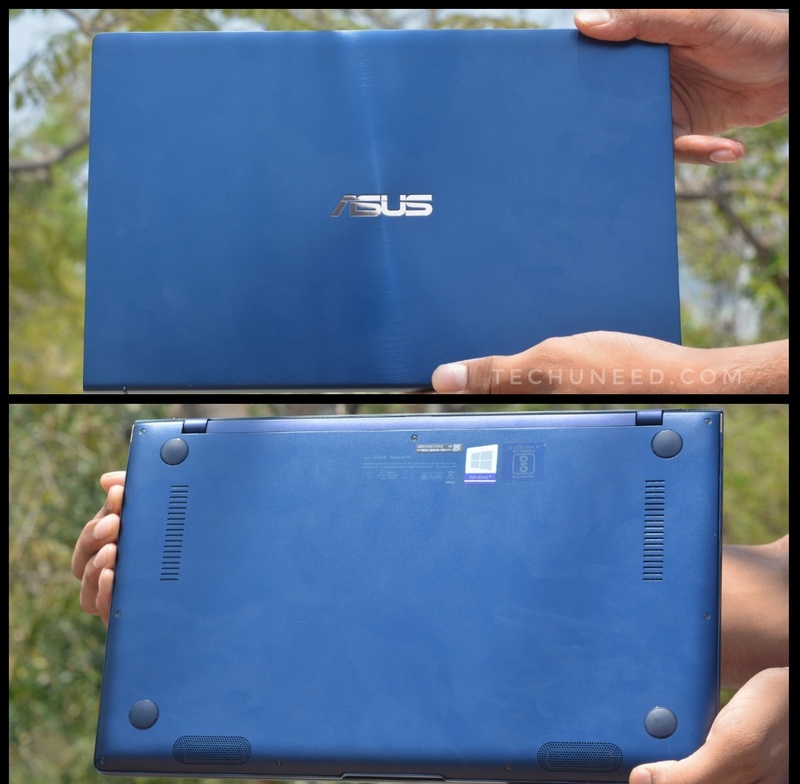 Asus Zenbook lineup of laptops cater to these users and turn out as a cheaper alternative to Macbook, if not better. 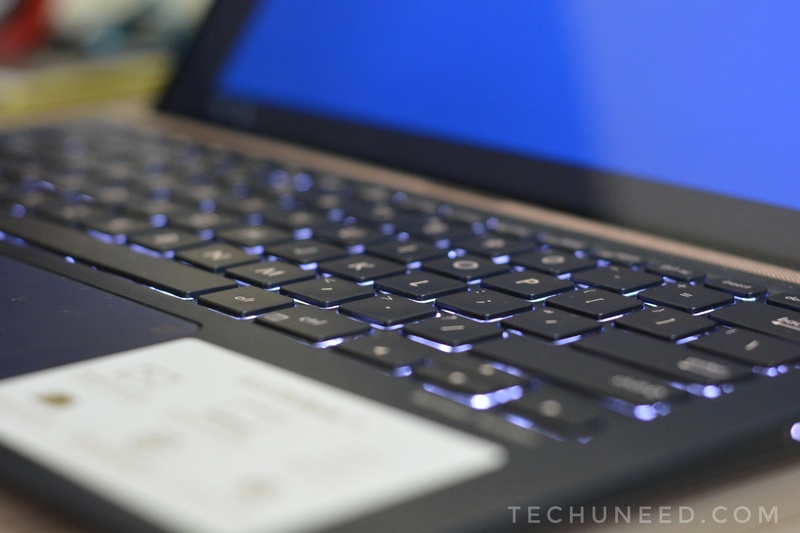 We tested the new Zenbook 14 UX433F Laptop recently and here is what we think of the same. 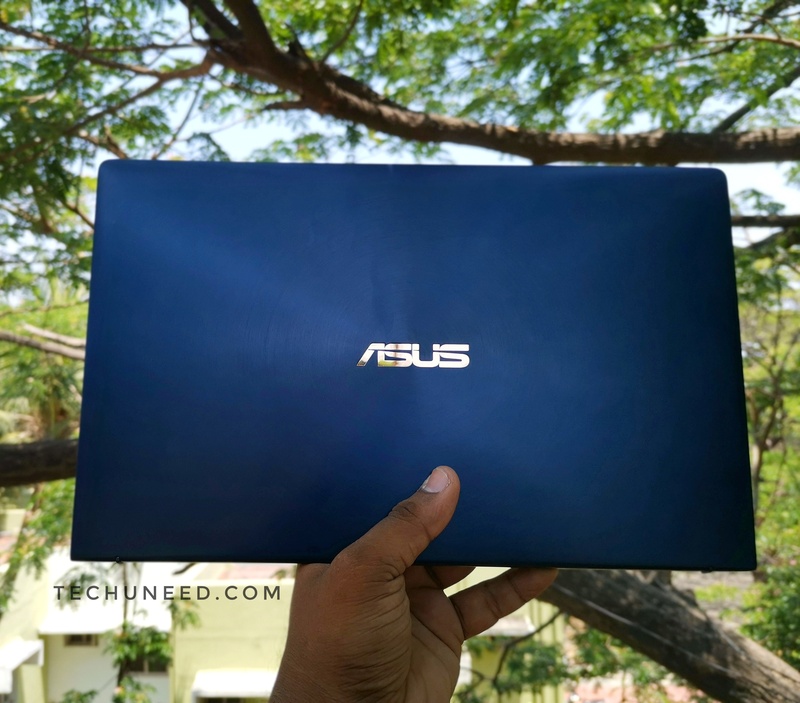 Let us see more in this Asus Zenbook 14 UX433F Laptop Review. Asus Zenbook 14 comes in a fairly compact box. 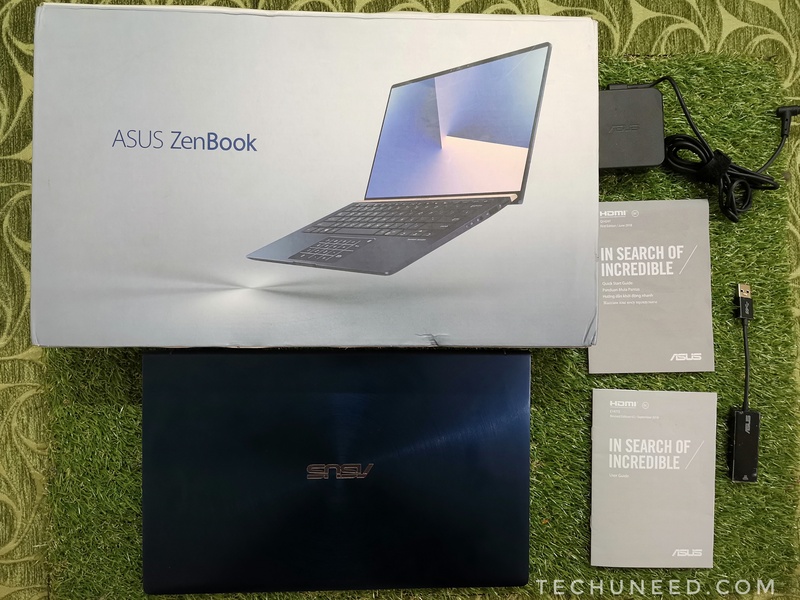 The box is minimalistic with an image of the Zenbook in the front along with Asus branding and Intel branding to the sides. The specifications are listed to the left and the back is left clean. Upon opening up the box, you will find several small boxes inside. You will find the compact 14-inch laptop in the first place which is followed by the regular user manual and warranty certificate. The power cord and the charger is housed separately in another box along with a USB to Ethernet Adapter. That’s it for the box contents and the box and the packaging looks clean and minimalistic. Asus Zenbook 14 UX433 is very sleek and weighs around just 1.09kg. 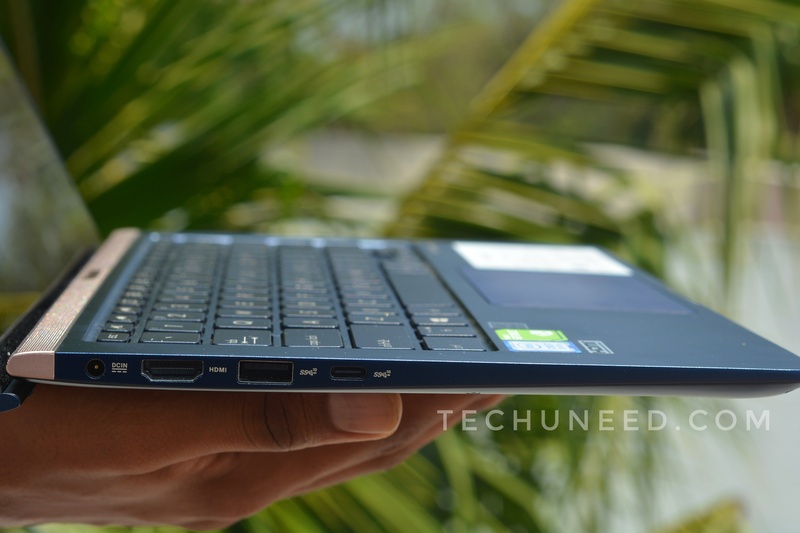 It is thin and lightweight, but Asus hasn’t compromised on the physical ports on this laptop. To the left, there is a DC-in port along with an HDMI, USB 3.1 Gen-2 and USB-C 3.1 Gen 2 port. To the right, you will find the light indicators, 3.5mm headphone jack(Thankfully, they are still retained in the laptops), a USB 2.0 port and a MicroSD card reader. The cooling vents and bottom firing speakers are present at the rear of the laptop. To the front, you will find Asus branding on the gorgeous circular ring design. Zenbook 14 looks stylish with a unique design and even weight distribution. 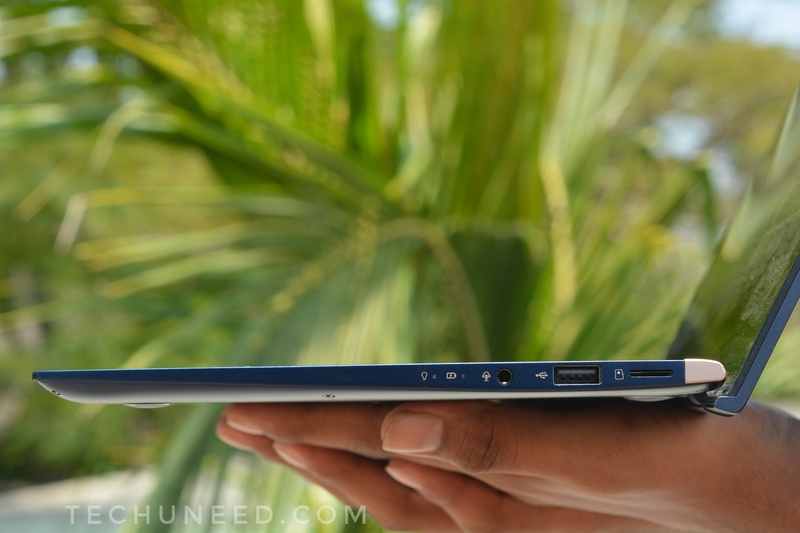 The thickness is just 0.63 inches which makes Zenbook 14 sleek and easy to carry. Ubiquity is the biggest advantage of such laptops. You can easily fit this laptop in your backpack and carry it wherever you go, without compromising on the productivity. The variant of Zenbook 14 UX433 comes with a Matte finish and metal all around. The materials used by Asus is good and it is evident in the build quality too. The laptop feels premium and gives you a comfortable feel when held. A good thing is that Zenbook 14 didn’t wobble during typing and when placed on a flat surface. We have seen many sleek laptops in this range have this issue. But we are glad to say that, this Zenbook doesn’t have such issues. 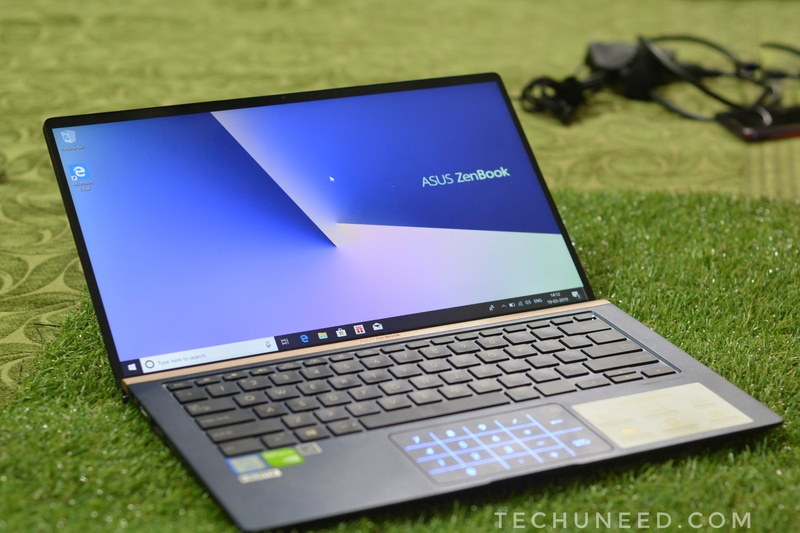 Overall, Asus has done a good job with regards to the materials used and the build quality on this Zenbook 14 UX433FN. Asus Zenbook 14 UX433 sports a small 14 inch FULL HD display with a resolution of 1920X1080. The bezels are narrow and account to almost 92% screen to body ratio. Asus calls it Four-side Frameless with Nano Design. Let us see more on the display on Asus Zenbook 14. We tested the display on bright sun doors and surprisingly, the display held up quite well and had decent visibility. The highlight of this laptop according to us is the gorgeous display. The bezels are narrow and the quality of the panel used by Asus is very good. You will get an immersive experience with regards to multimedia on this laptop. The field of view is also wide at 178 degrees which should help you not miss any frame in a video, photo, etc. When it comes to the indoor usage, you won’t be disappointed here too. The display can go very bright and you will have a great experience using the laptop. We also checked for any sort of light bleed on Zenbook 14 UX433 and fortunately, there were no issues as such. 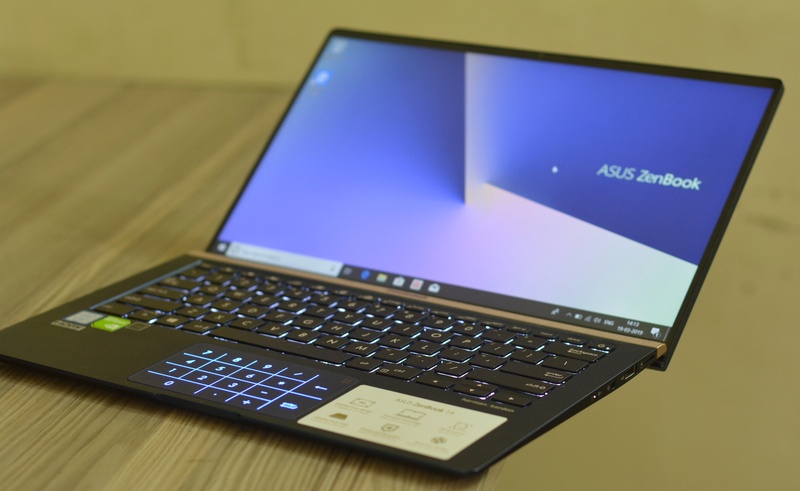 Asus Zenbook 14 UX433 comes in two configuration options i.e., Intel Core i5 8265U processor and Intel Core i7 8265U processor. The base clock frequency comes at 1.6GHz and 1.8GHz and users will get an option to TurboBoost up to 3.9GHz and 4.6GHz for the i5 and i7 variants respectively. 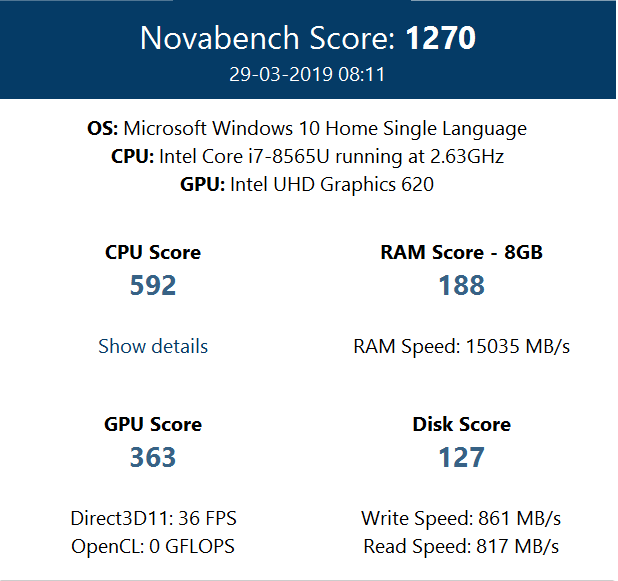 We tested the i7 8th generation Windows 10 variant which has a clock speed of 1.8GHz and overclockable up to 4.6GHz. When it comes to memory options, you will get either 256GB, 512GB or 1TB PCIe 3.0 SSD along with 8GB RAM respectively. 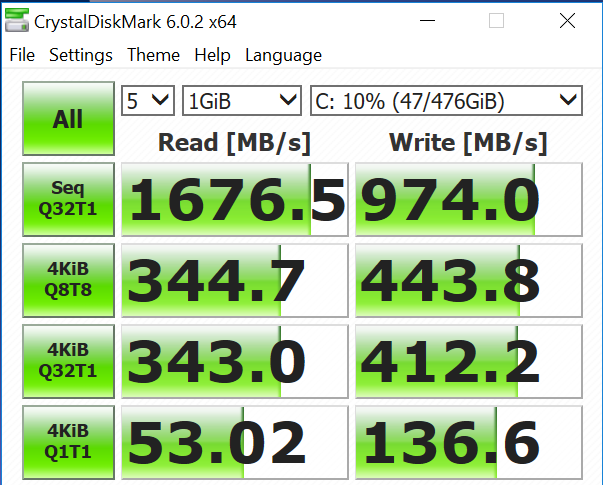 The variant that we tested had a 512GB PCIe 3.0 SSD. 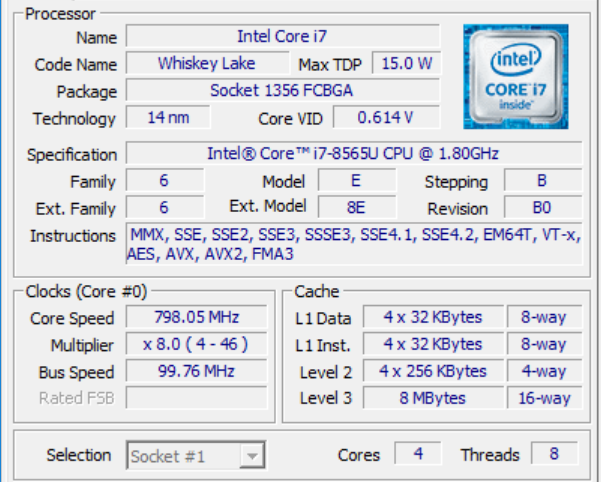 The boot times were very fast and the same goes with the read and write speeds. The disk read/write speeds can be found from the images below. and more. We were surprised by the quick render times on Premiere Pro. Thanks to the powerful CPU and PCIe SSD. It was able to handle the tasks without any issues. With regards to the GPU, it is powered by Nvidia GeForce MX150 2GB DDR5 graphics card and Intel UHD Graphics 620. The graphical performance was also great as usual and it was able to play graphics intensive titles like PUBG Desktop, Need for Speed, FIFA 19, GTA, etc. As said, the graphical performance was great, but it tends to exhibit mild heating. This isn’t a deal breaker and the temperatures are under control. But it does feel warm when held. Ubiquity is an important aspect with notebooks like Asus Zenbook UX433 and this laptop doesn’t disappoint you either. The laptop is sleek, portable and comfortable to carry wherever you travel. It has Gigabit WiFi to keep you connected to high-speed internet wherever you go. Zenbook 14 has a unique ErgoLift Hinge which will automatically tilt the keyboard when lifted. Nice touch by Asus! Zenbook 14 UX433 sports speakers from Harman Kardon. The speaker volumes were just decent on this laptop and the bass wasn’t punchy. We wish the audio level could have been better. Overall, the speaker is above average. The keyboard on the new Zenbook 14 UX433 has a good key-travel and gives good feedback on a keypress. The precision is accurate and the keyboard is backlit to help you use it without any issues when the light goes off. Overall, we did not find any issues with the keyboard and the experience was good. The unique selling point a.k.a USP of Zenbook 14 is the Dual Functionality Touchpad. 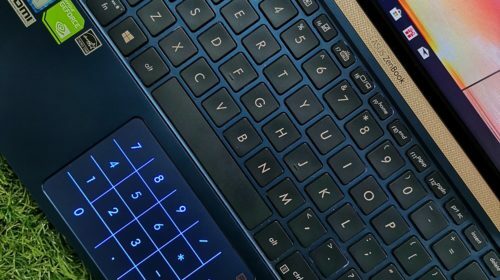 Asus has added the number pad on the display itself and it serves the purpose of a touchpad as well as a number pad. There is a dedicated button to turn on the number pad and the cursor works along with the number pad too. In our testing, we found it to be quite good and it also had some issues. The touch was not that responsive to inputs by the user and had slight trouble in identifying cursor click and number input. Don’t get us wrong. The experience is unique and quite decent, but as there was a slight delay, it has to be pointed out. 100-240V AC, 50/60Hz. When it comes to battery life, we got a good 3-3.5 hrs with this laptop. The laptop charges quickly too with the supplied 65W adapter. Asus Zenbook is priced at Rs.99,999 on Amazon India and at Rs.1,00,990 on Flipkart. The laptop delivers for the price at which it is selling. 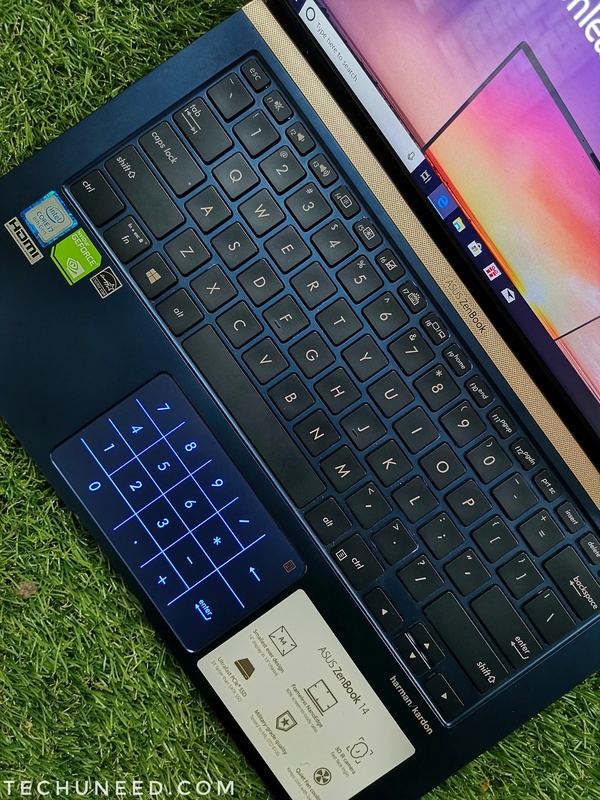 It checks almost all the boxes and we are impressed with this notebook and if you are a person who is looking for a compact laptop without compromising on the performance and productivity in this price segment, then Zenbook 14 is highly recommended.